From Sep 3 to Sep 5, Kongsfjord will be the venue for the Arctic DX Summit. Over the last few years, the Kongsfjord (KONG) and Lemmenjoki (LEM) crews have established a closer collaboration with regards to condx alerts, DX openings, loggings, equipment and QSLs. So it's about time we meet! OJ Sagdahl and Bjarne Mjelde (host) will meet with Finnish DX-ers Jim Solatie, Håkan Sundman, Hannu Tikkanen and Antti Aaltonen. We will test the novel QDFA antenna design, the new Winradio Excalibur SDR, discuss various facets of the DX hobby, eat Norwegian seafood (and surely more than that) and drink good wines (and surely more than that). Our intention is that the Arctic DX Summit will evolve into an annual event. My EAC s/n 204 R-390A isn't used for DX anymore, but I fire it up now and then to make sure that it works properly. And it always does. This time, I connected a pair of Logitech active speakers to the audio and line out connections. 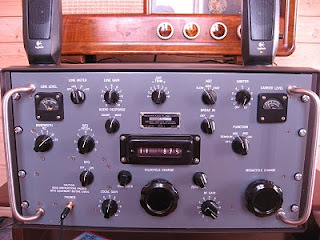 Using the Lankford-designed manual AM sync I can enjoy distortion-free reception with the R-390A. It is enabled by switching the BFO switch on. Tune the Pitch control to obtain zero beat. At the time I took the photo, I was tuned to Radio Romania's German service. The radio on top is a 1950's Radionette. Works perfectly too, except there's no light in the magic eye. the Federated States of Micronesia is an elusive country for MW enthusiasts in Europe, to my knowledge the only confirmed European reception is V6AJ 1503 kHz in Kongsfjord in 2007. Paul Walker is an announcer at Monster Radio 1150 WGGH Marion IL, and he has taken a special interest in the Micronesia radio scene. A result of this is a collection of air checks from V6AI 1494 kHz, relaying 88.1 FM using a "KUTE" moniker. Paul generously offered me to share these air checks with other DX-ers. They are around 45 minutes each and in MP3 format.